Most people have the notion that the mountain lodges are dirty and unhygienic places to stay which is far from truth. It might have been so, a decade back, but now the mountain lodges have been renovated and built according to the tourist standards. Although most of the lodges are basic, they are relatively clean and the food provided are hygienic. It is also a great place meet other fellow trekkers. 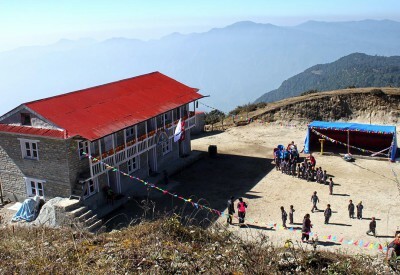 Moreover we do not operate lodge/tea-house treks in areas where the lodges are not up to the standard. We have carefully surveyed and selected the best lodges in the area keeping comfort and hygiene in mind. These lodges have clean rooms with comfortable beds, and you get an assorted food menu from which you get a wide range of items to choose from. Although most of the lodges have common toilets and bathrooms, they are relatively clean. The lodges are great at higher altitude as you get to sit in front of a warm and welcoming fireplace in the dining room, while it is freezing outside. 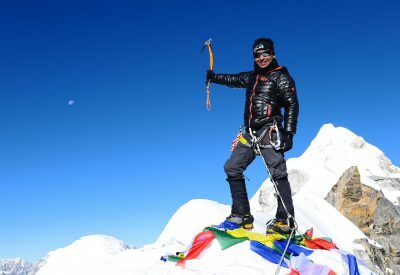 Your day begins with a wake up tea/ coffee at around 6 to 6:30 in the morning by one of the sherpas (crew). You will be then provided with a bowl of warm water for washing. Breakfast will be served according to your choice in the dining room. Setting off in the pleasant cool of the morning, we generally stop at around 11 A.M. at a lodge for lunch break. You need to order the food of your choice in the lodge. After lunch we generally walk for 3 to 4 hrs to reach our day’s destination and stay at our designated lodge. Tea/ Coffee and snacks will be served on arrival to the lodge. Dinner has to be order before 5 P.M. and is usually ready by 6:30 to 7 P.M. After dinner, it is a great time of day for reliving the events of the trek so far, planning the next day’s activities and for general socializing with other trekkers staying in the lodge. Group leader: Your most important member of your staff. Our Group leaders are highly trained in all aspects of the trek, conservation, first aid specializing on altitude sickness, emergency procedures and have extensive knowledge of the natural history of the area. Sirdar: His job is to manage and organize staff duties. He is responsible for the actual operation of the trek. 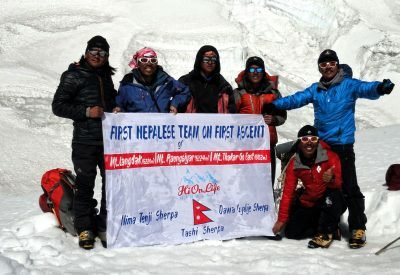 Sherpas: Their job is to lead your way and prepare your lodges and help in many other ways, like arranging the rooms, serve meals and sometimes help carry the back packs and even carry clients in times of medical emergencies. 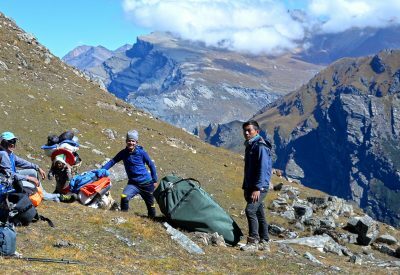 Porters: They are responsible to transport your trek bags, tents food and fuel and everything that may be required to the designated campsite. 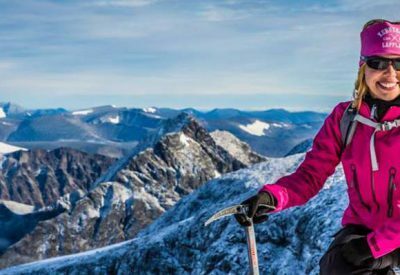 Please note: The term “Sirdar” is a designation given to the actual ground operation manager of the trek. He is responsible for organizing and transfering of the baggage and gears day to day along the trek. He organizes porter’s and sherpa’s duties, manages the bookings of the lodges and campsites and handles the financial budget of the trek. The term “sherpa” that is commonly used in trekking in Nepal is not to be confused with the tribe “Sherpa”. The former, with a small “s” is a designation given to the lead walker of the group while trekking, and the later, with a capital “S” is an indigenous tribe living in the Himalayas. The tribe Sherpa are renowned for their unparalleled physical ability at high altitude and climbing high mountains. Their family name is Sherpa and they often work as Climbing guides and Climbing Sherpas. Camping treks are overland journeys, involving the support of a trek crew to carry personal belongings along with tents, food, fuel and cooking equipment. The pioneer explorers and mountaineers used this very form of travel while exploring the unknown areas. Sleeping tents, dinning mess tents, toilet tents, cooking tents and also tables and chairs are carried by porters. In fact it is a small world of your own. The cook and the kitchen crew prepares hot food which is normally a very balanced diet comprising of fresh vegetables and breads, to pastas and sandwiches and occasionally even cakes and pizzas. Breakfasts are usually bread eggs and cereals, and lunch and dinner are a three course meals. We make sure that you get the required amount of carbohydrates and proteins and vitamins as you burn a lot of calories walking uphills, so plenty of vegetables, canned meat and fish and eggs and cereals are carried. Your day begins with a wake up tea/ coffee at around 6 to 6:30 in the morning by one of the kitchen crew. You will be then provided with a bowl of warm water for washing. Tables and chairs will be set in the open place of your campsite where breakfast will be served. Setting off in the pleasant cool of the morning, you will generally reach our lunch stop by 11 am. The cook crew, having overtaken us on the trail, will already have the lunch preparations well under way. Lunch usually takes an hour to an hour an half. During the aftrenoon our porters will usually overtake the group, aiming to reach the camp before our arrival by 3 or 4 p.m.. Tea/ Coffee and snacks will be served on arrival to the camp. Dinner is usually ready by early evening and is a 3-course meal served in the mess tent. Kerosene lamp lights are used for light in the mess tent. After dinner, it is a great time of day for reliving the events of the trek so far, planning the next day’s activities and for general socializing. Cook: Responsible for your food. Hygiene of a high standard is taken into consideration in preparing the food. Kitchen helpers: Helps the cook in preparing your meal. Sherpas: Their job is to lead your way and prepare your campsites, put up tents, and help in many other ways, like serving meals in the dining tent and sometimes help carry the back packs and even carry clients in times of medical emergencies. Porters: They are responsible to transport your duffel bags, tents food and fuel and everything that may be required to the designated campsites.